By Fergus D. H. Macdowall Editor-in-Chief, William L. MacDougall Editor, Scott A. MacDougald Associate Editor, Suzanne O. McDougal Production Editor, and eight talented Contributing Writers. The MacDowalls became available in June 2009. 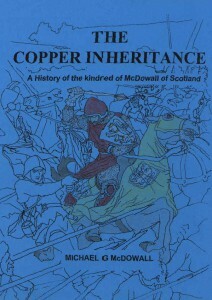 The book traces glories, tragedies, and accomplishments of the MacDowall kindred from their beginnings in Scotland and Ireland to their emigrations to such countries as the United States, Canada, Australia, the Netherlands, Sweden, and Russia. The cast of characters ranges from kings, barons and builders, to artists and generals, farmers and settlers, homemakers, and teachers. Their stories unfold as a progressing history of the Macdowalls. 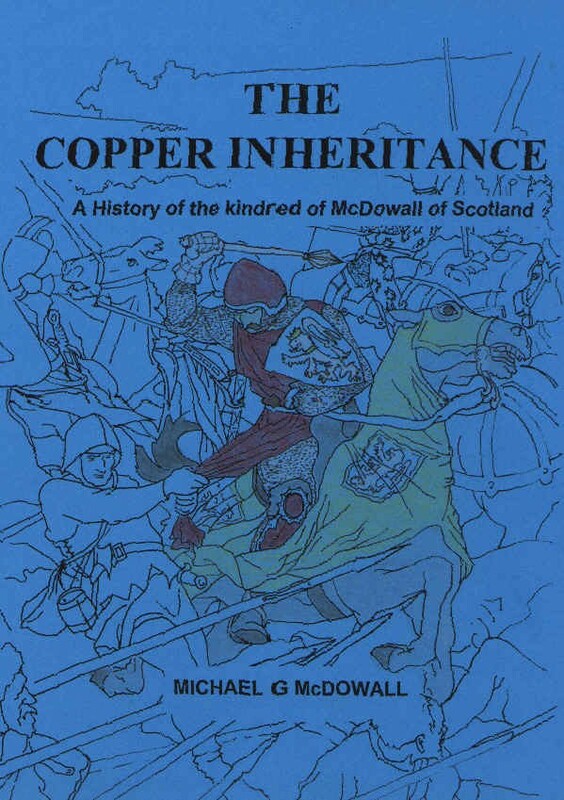 The Macdowall kindred includes many spelling variations of the surname including McDowell, MacDowel, Macdowal, MacDowyl, McDuyl, Macdoual, MacDool, McDoll, Macdougall – the original ancient name of the MacDowalls which derived from the name Duegald (Gaelic Dughaill) from which the family’s founder derived his name. Other names within the MacDowalls include Coyle, Dole, Dowall, Dugal, Dugle, Duwall, Duvall, M’Gowall, and Kyle. Several additional spellings of the name are identified in the book’s listing of Names and Spellings. The MacDowalls is well written and is very interesting to read because it has such a variety of topics. This is perhaps the first book ever to attempt to give a broad overview of the MacDowalls and some of their accomplishments over the past 900 years. Over their 182 pages the Introduction and the Chapters cover a broad array of topics. 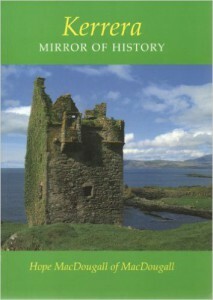 The Chapters include the ancient history in Galloway, the Macdougalls of Makerstoun cadet, castles and abbeys and other structures relating to the Macdowalls in Galloway, emigration and settlement of North America, prominent MacDowalls in North American history, and emigrations of families to the Netherlands, Sweden and Russia. 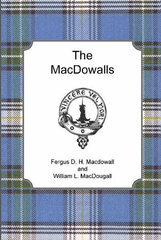 Fergus D. H. Macdowall Chief of the Name has directed that all profits from the sale of this book are to be held in Trust by the Clan MacDougall Society of North America to be used for promoting the heritage of the MacDowalls. 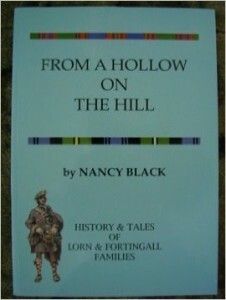 This book uses of the new MacDowall Tartan pattern as its book cover. The MacDowalls may be purchased through Lulu.com . The soft cover price is $19.00 plus shipping. Also your local bookstore can order it for you; but may ask for the ISBN 978-0-578-02679-4. Major outlets such as amazon.com or barnesandnoble.com may offer it at their own prices. An informal history told through the real-life stories of clanspeople starting with Somerled, whose son Dougall founded the clan, and continuing with their notable descendants up to modern times — Crusaders, admirals, generals, government leaders, farmers, and teachers — even the chief of an Indian tribe in South America. The book is intended to be easy reading for everybody. The narrative contains accounts of dozens of clansmen and women who left Scotland and emigrated to other parts of Europe, North America, South America, Africa, and Australia where their descendants are thriving today. Proceeds to benefit the Dunollie Preservation Trust Fund. To order, contact Richard MacDougal at: 63 Murray Hill Dr., Bluffton, SC. 29909, or via e-mail at: dnbmacdougal@juno.com. The price is $16.40 (US) for each book, which includes mailing cost. 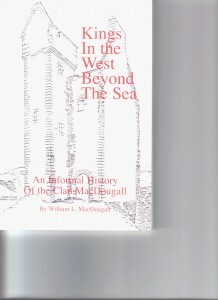 A compendium of facts, stories, history, and photograph relating to a number of MacDougall lines and the families into which they married both within a large area around Oban, Scotland, and in such far off places as Australia. From her tremendous background and prodigious research Miss Black provides insight into the life and times of our ancestors which is not available either in more limited family histories or in general histories. Among those whom Miss Black traces in her own ancestry are the famous family of MacDougall bagpipe makers and players. This book is must for those seriously interested in how their ancestors lived or who want to understand more fully the web of social interconnections which existed in the Highlands and across the oceans to distant lands. This book may still be available through the author. By Jean MacDougall (sister of our Thirtieth Chief). By Hope MacDougall of MacDougall (sister of our Thirtieth Chief). 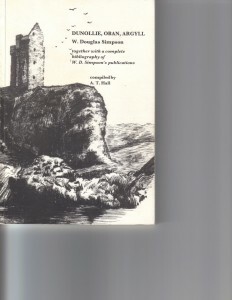 By W. Douglas Simpson and Compiled by A.T. Hall Center For Scottish Studies, University of Aberdeen (1991), Old Aberdeen, Scotland, AB9 2UB. Original price of 3.95 pounds should be verified when ordering. This book of 118 pages was written by a very well respected archaeologist and historian from the University of Aberdeen who specialized in castles and fortifications. This book is well researched and footnoted with his research sources. A scholarly study of the history and the geographic setting of Dunollie and Gylen castles and the Oban area from prehistory, through the dark ages, and feudal ages up to the time of building of the Dunollie Manor House. This is a source of historic information from documents and from within our Chief’s family which is not generally available. It includes a detailed analysis of the Brooch of Lorn, its history, and its provenance. 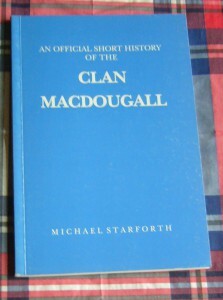 The two little booklets in the series were written by Fergus D. H. Macdowall of Garthland. 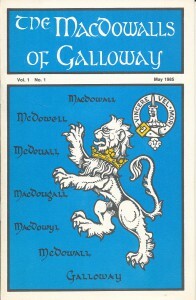 These booklets are filled with articles on the traditions and history of the MacDowalls of Galloway, their cadets, and their many branches. There are pedigrees of the main families, and discussions of their Heraldic symbols and meanings. Cascade Publishing Company, Jedburgh, Scotland. Contains interesting old prints and fine color reproductions of our crest and tartan. Text is not always reliable. It may be purchased at commercial book sellers. The MacDougalls of Lorn DVD is an historical presentation celebrating 850 years of Clan MacDougall history with music and Gaelic song, and with images and photos with written explanations. The DVD presentation runs about 35 minutes in the English, French or Spanish language versions which are all on one DVD. 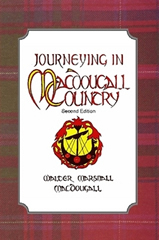 This DVD is the successor to the earlier English language CD “The MacDougalls of Lorn” created by Past President Walter Macdougall and a team of Clan MacDougall Society of North America volunteers. 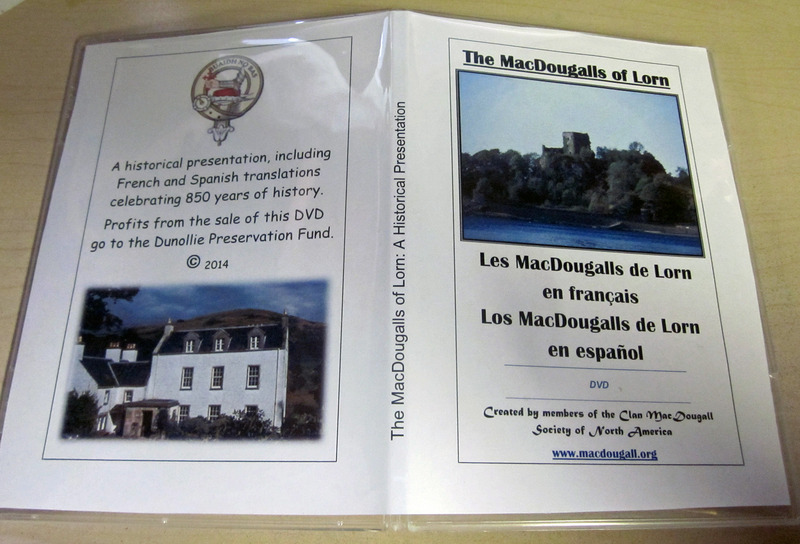 The MacDougalls of Lorn DVD is the work of many volunteers to bring the story of Clan MacDougall in English, French and Spanish to our clansmen around the world in a universal DVD format playable in their own regions. When this DVD becomes available for purchase, profits from sales of the DVD will be donated to the Dunollie Preservation Trust Fund to support the preservation work at Dunollie. The MacDougalls of Lorn English, Spanish, and French versions of the text and photos tell the story of clan MacDougall, while the music and the Gaelic songs play in the background. The DVD is formatted in Universal Format so that it may be also be played on television by DVD players using the standard formats established for various continents such as Europe, North and South America. 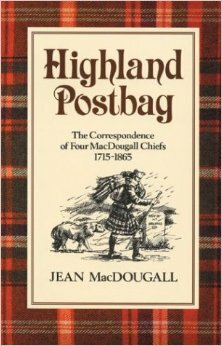 The first two copies of The MacDougalls of Lorn DVD were presented to the Chief of Clan MacDougall at our Clan MacDougall Gathering in Oban in August 2014. 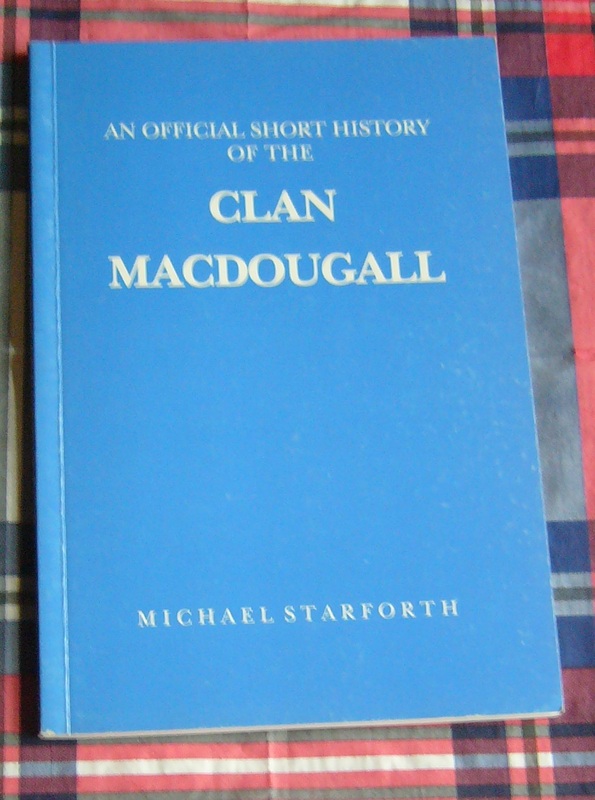 The Clan and Kindred of MacDowall is half hour long term overview of Clan MacDowalls’ origins, life in Galloway, and emigrations to Ireland and North America and to places beyond. The DVD’s photos, maps and images are supported by written commentary while music from each time period plays in the background. Though it covers more than a millennium of history including periods where records are scant, our creators have done our utmost to ensure accuracy. 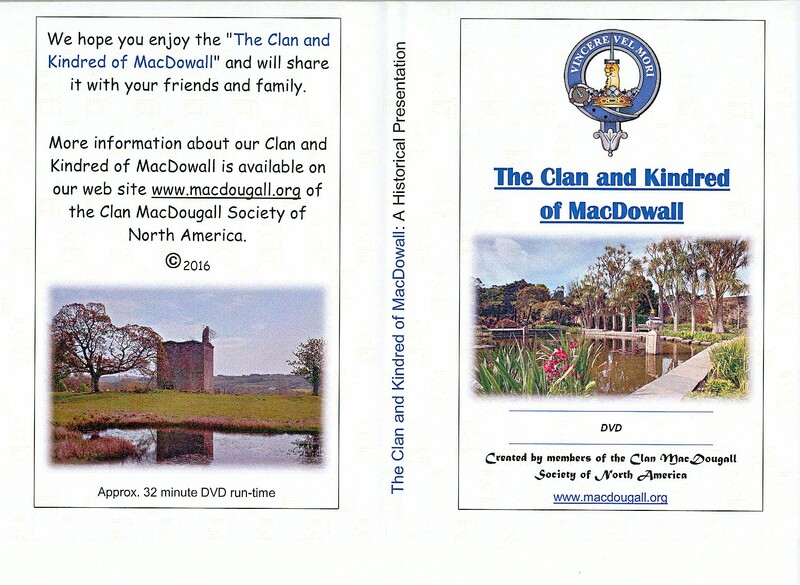 The DVD tells the story of Clan MacDowall in a modern way which is easy to understand. 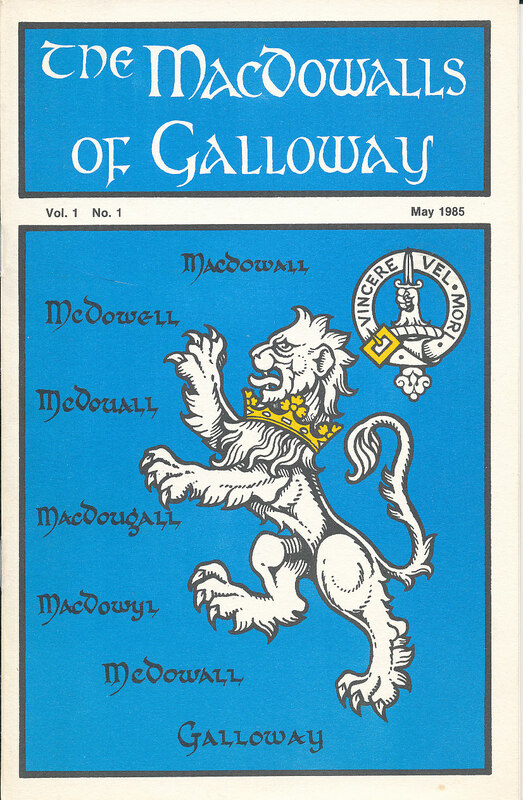 The Clan and Kindred of MacDowall is the creation of Society Officers to support and preserve the Clan MacDowall heritage and history. As yet the Society has not decided how best to make this DVD available to the wider world. However, whatever we do, any profit derived from it will be used by the Society to support the heritage of Clan MacDowall. There is a long and proud history between MacDougalls and bagpipes. Not only have there been a number of well-regarded MacDougall pipers, but during the 19th century the MacDougall family of bagpipe makers operated an establishment in Perth whose bagpipes are still regarded as among the best ever made. So it seems only fitting that MacDougalls and their descendants would take up writing about pipes and piping. 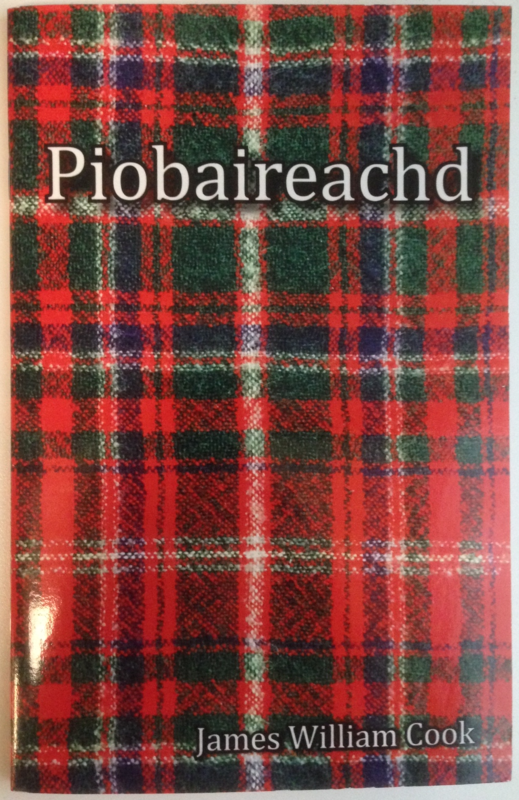 One such product is a book produced by a member of our own Society, James William Cook, who has authored this slim volume, Piobaireachd. For those not familiar, piobaireachd (pronounced something like “PEE-brock) is the classical music of the Great Highland Bagpipe. Piobaireachd, or Ceol Mor (literally, “big music”), is characterized by a musical theme that is repeated with increasingly complex variations. Piobaireachd is a slow music that is entirely unique to Scotland. 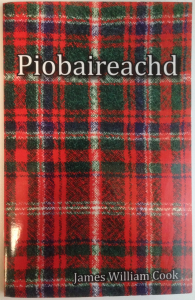 This book is not a history of piobaireachd, nor is it rightly characterized as an instructional manual (though it does contain some instructions on the embellishments used in piobaireachd). It is perhaps better characterized as a reference book. After a brief introduction it describes each of the embellishments used in piobaireachd, together with its name and how it appears in musical notation. Perhaps the most valuable element is that this volume includes the canntaireachd (“CANT-rock”) for each embellishment. Before the musical notation for the Great Highland Bagpipe was regularized, piobaireachd was taught using canntaireachd, a system of “singing” the embellishments for each piece. The piobaireachd manuscripts that survive from the time before notation was regularized are written using a form of the canntaireachd, making them very difficult for non-experts to understand. This volume is a useful reference for anyone from the aspiring piobaireachd player who needs a ready reference, to the curious musician not familiar with piping notation, to the those who are just curious about this unique musical form. If you would like to purchase a copy of this book, you can purchase it from Amazon ($40) or directly from the author at jwlscook@netecin.net ($30).